We’re very excited to report that the FCC last week extended the coverage for unlicensed V-Band from 57-64 GHz to 57-71 GHz, for a total of 14 GHz of contiguous spectrum. This action validates our focus on V-Band, which has now been greatly expanded. The FCC has clearly shown the vision that unlicensed millimeter wave has a huge future in the wireless broadband market. Read our press release. What’s more, industry experts predict that the millimeter market will reach $729 million by 2018, with a 100% year-over-year growth in the Fiber Extension and WISP segments. And Infonetics Research states that the Small Cell Backhaul market will reach $1.46B by 2020, with over 60% of video traffic being download from mobile devices. In terms of industry standards, it’s important to note that the 5G spec now incorporates V-Band. The overwhelming amount of mobile data demand now requires Gig and multi-Gig solutions to meet the backhaul needs of today’s subscribers. As the leading innovator in V-Band, we continue to deliver improvements to our advanced HaulPass V60s™ radio link. We’ll be releasing a new software upgrade that will greatly improve the installation process, including easy alignment with no tools required. Easy-to-read LEDs make alignment a snap. More information is now available for link performance and reliability with peer statistics from both sides of the link. And link budget and predicting rain fade has never been easier. How is this possible? After all, most V-Band vendors adjust to changing conditions by dialing down bandwidth. But this can reduce the throughput for the entire network. We have a better solution. Our V60s radio incorporates Intelligent Automatic Gain Control. With this approach, network throughput is maintained even under the harshest environmental conditions. Want to learn more about the benefits of Intelligent AGC? Download our free white papers at right for all the details. We love hearing from our customers. If you have questions or comments, please do not hesitate to contact me directly. 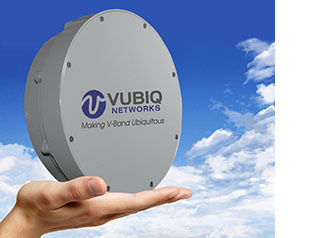 Click below to read our press release on the FCC’s expansion of V-Band. 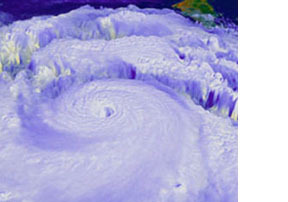 Click below to download your free copy of our Rain Fade white paper. Click below to download your free copy of our Intelligent AGC white paper. As we embark on the new year, it’s rewarding to look back on our innovative developments throughout 2015. What’s more, 2016 promises to bring even more innovation. Like our latest firmware upgrade release adding SNMP support to our HaulPass V60s™ Gigabit Ethernet wireless solution. SNMP support lets our customers tightly integrate the wireless infrastructure into their custom monitoring software. 2015 saw tremendous growth in the millimeter wave market, particularly in the 60 GHz V-Band segment, with Infonetics forecasting a five-year CAGR of 39%. 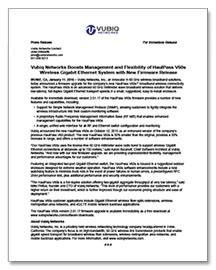 As a leader in V-Band broadband wireless, we shipped our HaulPass V60 link to a wide range of customers, including fiber providers such as Fiber Internet Center and WISPs such as GigXero. “We are pleased with the ease of installation and full-duplex gigabit throughput of the HaulPass solution,” said Kristopher Pacunas, CEO of GigXero. In August, we were awarded yet another technology patent, increasing our portfolio to 13 valuable patents. These patents allow us to continue to create and market proprietary and protected solutions that greatly benefit our customers. In October we announced and shipped our brand new HaulPass V60s wireless link. This new, streamlined version of our HaulPass link is 50% smaller than the original HaulPass V60, provides a 50% increase in range up to 750 meters, and offers a more aesthetic appearance for urban applications and street mounting. We wish you success in 2016 – a new year that promises even more innovation from Vubiq. Click below to read the press release announcing the latest HaulPass V60s firmware upgrade, adding support for SNMP, RF MIB, and a unified web interface. Click below to get all the details on our brand new HaulPass V60s link.